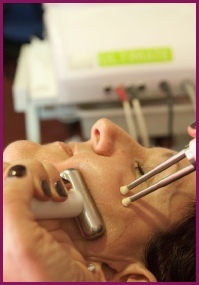 CACI is a leading name in the beauty industry for non-surgical facial treatments. 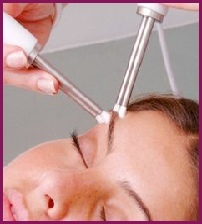 The CACI signature Non Surgical Facial Toning is an advanced facial treatment with 20 years medical research behind it. Microcurrent impulses will lift and tone the facial muscles and neck area. It will improve skin elasticity and reduce the appearance of fine lines and wrinkles - giving a more youthful, fresh appearance and glow. The CACI Jowl Lift Treatment has been developed to specifically target muscle laxity around the jaw line which can cause drooping jowls. The treatment refines facial contours to give a firmer, more toned appearance. Often most effective used alongside facial toning. surge of moisture to the skin, soothing and calming skin redness and irritation. Aesthetician, Anita Powell, has worked successfully with CACI equipment and many clients over a 5 year period and will discuss with clients the desired outcomes, and the best programme of treatments and thus the likely time scale and cost involved. Call for a consultation or treatment and start your relaxing, safe and painless journey to a more beautiful and confident you.